← The Travelling Gourmet is A TOUGH COOKIE! They will blow up your appetite! In large bowl, mix butter and brown sugar. Add vanilla, flour and milk, mixing until well combined. Fold in chocolate chips. Shape mixture into 16 balls; place on a tray. Place tray in freezer until balls are frozen. 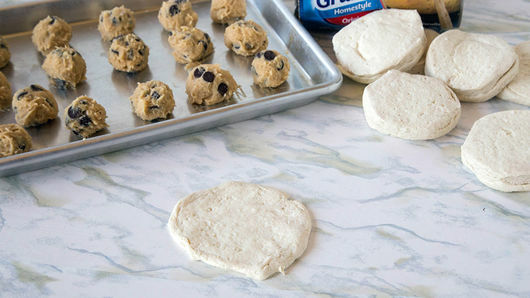 Heat Preheat oven to 350° F/150 C. make dough into round circles about 3 inches in diameter. Using your hands or roll with rolling pin, press each into 3-inch circle. Grease Spray 9-inch pie plate with cooking spray or brush with butter (NO margarine and trans fat with palm oil). Place 1 cookie dough ball in center of each dough circle. 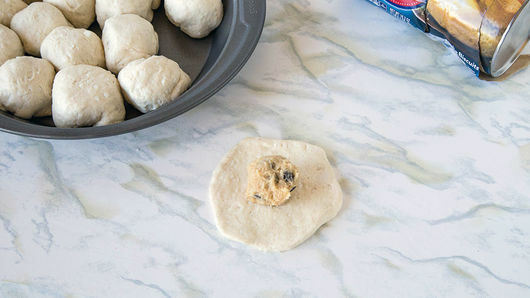 Fold dough around ball, and press to seal around ball. Place seam side down in pie plate. Like making a big Ravioli. 4 Bake 18 to 22 minutes or until biscuits are golden brown and cooked through. Different ovens will take longer or shorter times. Keep your eye on them! Cool 5 minutes before serving. Drizzle with chocolate sauce and honey! Enjoy wirh strong macho double Espresso coffee! Black like the midnight sky! Good with Rum and Raisin Ice Cream too! More RUM, less raisins!!! Ha1 Ha! One TOUGH Cookie! When the going gets tough, the TOUGH eat cookies! This entry was posted in Art, Food and drink, Let them eat Cake..., Snacks & Little Bites and tagged Dr. Michael Lim The Travelling Gourmet, Johnny English Rebroin, One TOUGH Cookie. Bookmark the permalink.